I think that deep down all of us are magpies at heart. Whether we realise it or not, each of us collects things as we go through our lives. Even in this very moment, as I look around my desk, I can see a collection of pens, used notepads, books, coffee cups in various stages of emptiness, and even a collection of things to do (stretching over several pages…). These are the things I unconsciously gather around myself in my everyday life. They’re the markers of what I do, of how I spend my time. And they feel a lot like clutter. When we’re on holidays our collecting is different. It might be shells and pebbles from a beautiful beach, or a spring of flowers that we leave to dry in a vase. It might be those kitsch little souvenir spoons or those teeny tiny soaps from our hotel room. It might be the photos we take because we want a moment to last forever. Or it might be something less material but more substantial—like memories. Whatever it is, and even if we don’t think of ourselves as collectors, most of us like to gather things to mark special moments in our lives. It’s part of being human. 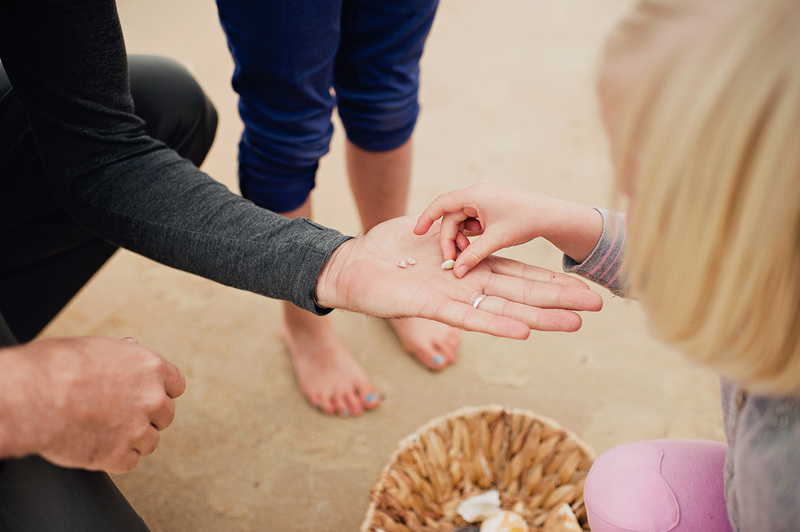 The gentle pursuit of fossicking has become part of Michael and Julia’s family story—part of the joy that they now share with their children whenever they visit Tasmania’s east coast. 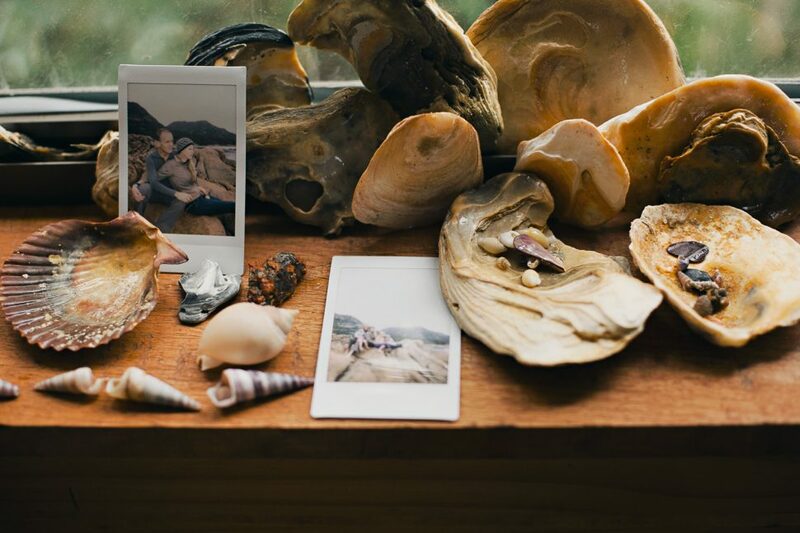 It’s such a simple thing, but for this family it represents so much more than a handful of cowrie shells or a gleaming, sea-polished pebble. These small acts of searching and discovery are meaningful because they’re about noticing things, about taking the time to pay attention. Sometimes the most enriching experiences in life are not big gestures or grand events but the unexpected wonder that comes when we allow ourselves to be immersed in a moment; to stop and just be in the present instead of rushing to the next experience, the next commitment, the next thing. In Michael’s story he says that when he and his family are on their east coast holidays, ‘time passes because time is available’. How often do we fret and worry that we don’t have enough time? There are 24 hours in each day of our regular lives, and there would still be 24 hours in the day if we were fossicking on a beach on Tasmania’s east coast instead of sitting in our office or car. The only difference is how we feel about those hours and what we choose to do with them. The last time I was at Freycinet National Park—just a few weeks ago—my teenage son came to me with his hand held out before him and a look of pure wonder on his face. In his outstretched palm was cradled a tiny, perfect sawfish bone. We sat on the sand with our heads pressed together, marveling over every minute, perfect tooth on that amazing snout, and wondering how such a formidable fish could begin its life as a thing so fragile and small. The discovery itself was fascinating, but the real treasure was in those few minutes with my son. 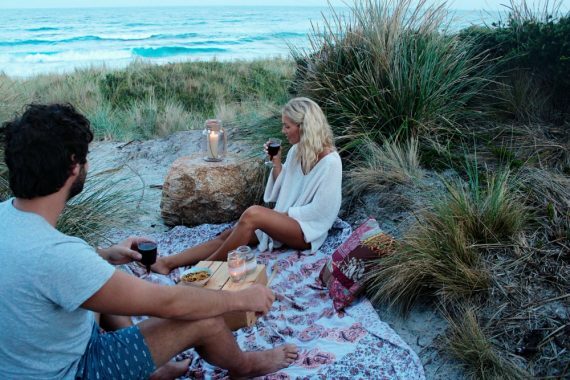 I don’t think I’ll ever forget the feeling of sitting with him on the sand and sharing that simple, quiet moment of wonder. The east coast of Tasmania has taught me, just as it’s taught Michael and Julia, that the simplest experiences can lead to some of the greatest moments of our lives—times of connection with the people that are important to us, a reason to stop and appreciate the richness of life in all its patterns and forms, and a chance to create the memories and traditions that define and enrich our lives. It’s really so simple and so powerful. And, luckily for all of us, so easy to find—all you have to do is look in the right place. Most people do not need to be convinced about the importance of taking the time to take a break from their everyday routine. But unfortunately most of us find it hard to do. So we thought we'd provide you with a little inspiration. What makes a dream road trip? The perfect road trip experience is different for everyone. It could be anything from a few unplanned days of meandering and discovering places and experiences along the way, or a carefully planned trip filled with your must-do moments. 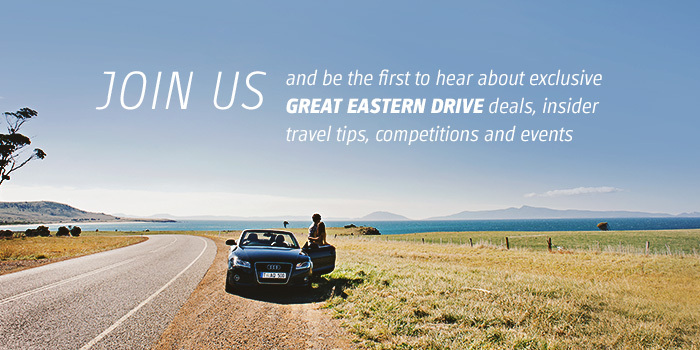 We've put together what we think are the key ingredients to a dream road trip, and very soon you'll have the chance to win it.